I'm a sucker for Lush products, yet it's been years since I tried one of their gift sets. 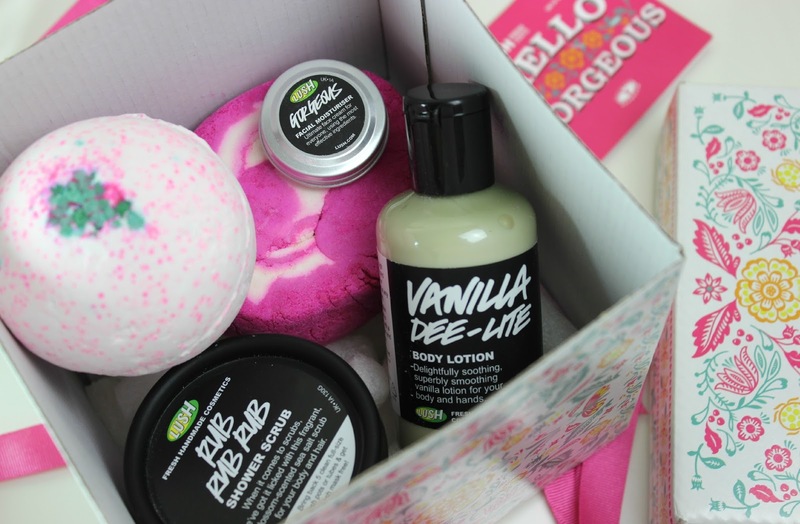 A great way to try a variety of products in one, I've been taking full advantage of the Hello Gorgeous Gift Set, featuring five deliciously scented and super pampering Lush best-sellers. 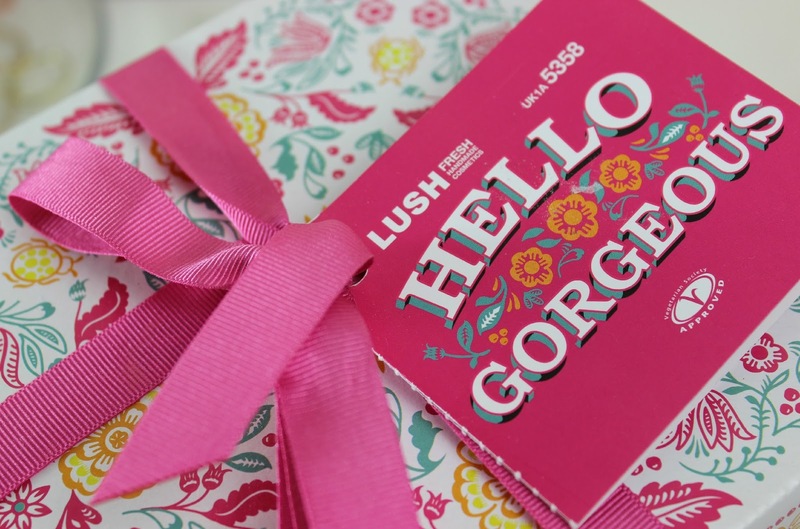 Like all Lush products themselves, the gift sets are gorgeously presented and I am completely smitten with the box for Hello Gorgeous*. So much so that I've decided to keep it and use it as a little keepsakes box; a beautifully wild and blooming floral design with birds in flight and a gorgeous colour scheme of yellow, orange, teal and red, wrapped in a feminine pink bow for that extra special touch. Inside neatly tucked away are five products covering everything you need to enjoy pampering bubble baths and get super-soft skin. I've wanted to try Rub Rub Rub Shower Scrub for so long now, so it's definitely the most exciting product in Hello Gorgeous for me. A bright blue blossom-scented sea salt scrub that can be used for both body and hair, it smells lovely and fresh. Hello Gorgeous includes a very decently sized 130g tub, but you can also buy this individually in a 330g tub for £8.75. Have you tried Rub Rub Rub before? Next up we have two bath products that I've used many times before, and two of my most repurchased Lush products. The Comforter is huge at 200g, a bright pink and white swirled bubble bar with a fruity blackcurrant scent formulated with Cassis Absolute and Bergamot Oil. I adore Lush bubble bars, you can get so many uses out of them and they create so many bubbles that bath time is always fun! I usually get 4-5 uses out of The Comforter, and you can pick this one up individually for £4.75. Sakura Bath Bomb is a very soothing bath bomb that I particularly love using for a mid-week wind down. It teams Mimosa, Jasmine and Citrus to create a gorgeous but subtle scent and has a very pretty design; white with pink and turquoise dots and a centre topped with turquoise crystals. You can pick this one up on it's own for £3.35! There's a 10g sample of Gorgeous Facial Moisturiser included in the gift set, a product I've never tried - or heard of. Described as an exquisite moisturiser formulated with freshly juiced fruits and cold-pressed organic oils, it promises to leave skin feeling revived and softer in texture with a brighter complexion. Looking forward to giving this one a try, which you can pick up in full size at £42.50 for 45g. Last but not least, a product I've tried once before and absolutely adored, the Hello Gorgeous gift set includes a 100g Vanilla Dee-Lite Body Lotion. If you love vanilla scents then you will be smitten with this; a subtle yet warming vanilla scented lotion with a light-weight consistency that feels instantaneously soothing once applied, leaving skin feeling soft as silk. Lovely! 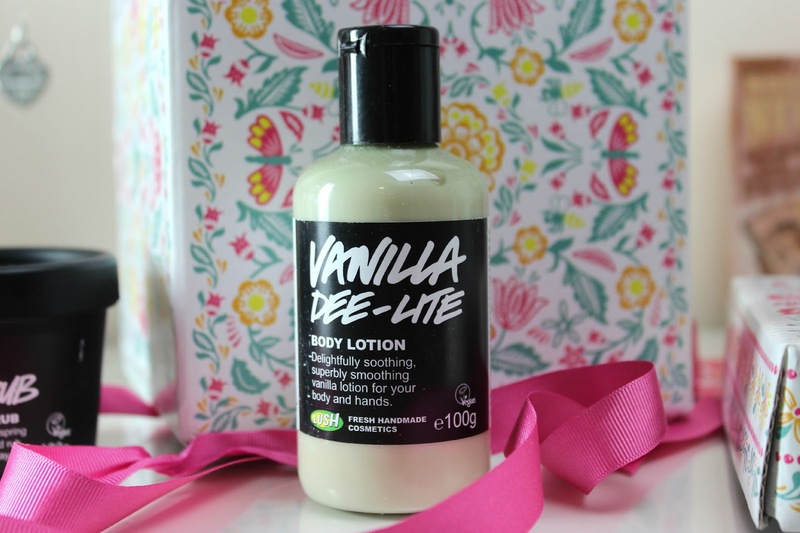 Vanilla Dee-Lite is available individually at £12.95 for a 250g bottle. The Hello Gorgeous gift set is a sure fire way to leave you feeling gorgeous, with perfectly pampering products and addictive scents. At £22.95 I think it's a pretty purse-friendly set and such a lovely gift for friends and loved ones, an even nicer treat for yourself! The selection of products is fab and it's definitely made me want to explore the Lush gift sets next time I'm in store. Are you a fan of any of the products inside Hello Gorgeous? Are there any gift sets from Lush you think I should check out? Let me know, and if you have any Lush product recommendations be sure to leave them below - I'm always on the hunt for more products to try! I love the comforter, I'm always re-buying it. I love Rub Rub Rub....definately the best exfoliater Iv tried...As you mentioned it can be used on hair but personally it dried my hair out and I would never do it again, took me about 4 washes to get it feeling back to normal, its good on your feet too. I've never had a Lush gift set before, but always wanted to buy one. This one looks lovely, I really want to try The Comforter!